According to Zia Mody, these cases not only reflects the tragedy of the Indian Woman, but also the emergence of jurisprudence which also seeks to set it right. Unfortunately, what remains is the practical reality of a long road yet to be travelled to unwind institutional and cultural discrimination against women. Maneka Gandhi case became famous after emergency which was decided in 1978. During emergency fundamental rights of citizens were suspended and this is how India was declared as a police state. Maneka Gandhi was issued a passport, she was asked to surrender her passport under section 10(3)(c ) of the Act in public interest, within 7 days from the date of receipt of the letter. Maneka Gandhi immediately wrote a letter to the Regional passport officer New Delhi seeking in return a copy of the statement of reasons for such order. However the government of India, Ministry of External Affairs refused to produce any such reason in the interest of general public. Mody explains the issue of fundamental rights has been in discussion right from 1950 when the Supreme Court had decided A K Gopalan case. Mody closes discussion with important observation ‘Maneka Gandhi is a reflection of dynamic constitutional interpretation’. The Shah Bano case suddenly became politically controversial case where an ordinary Muslim woman Shah Bano found herself in the eye of the storm. She was given alimony by the Supreme Court. The case would have been forgotten but for the comments of the Supreme Court during the judgement. The Supreme Court commented about lack of uniform civil code in the country. The Maulanas picked up this and declared that the judgement amounts to interference in the religious matters of the Muslim community. Then began the political tussle between the vote-bank politics and progressive forces. Finally the Rajiv Gandhi government got a constitutional amendment to by-pass this judgement. Mody has discussed both the political as well as legal aspects of this case. The Vishaka judgement, set guidelines to address sexual harassment at the workplace. The Supreme Court drew on CEDAW (the Convention on the Elimination of all forms of Discrimination Against Women, signed by India in 1980) saying, we don’t have a law on this and therefore, under Article 142, we will declare guidelines, until the parliament does something about it. Vishaka was one of the most progressive forms of judicial activism and it has had a lasting effect. Responsible MNCs and Indian companies are alive to what Vishaka is. Some have already got committees. Others know that when they face a problem, they will need to activate one right away. The Supreme Court in the the Aruna Shanbaug case elucidated its views on euthanasia The chapter on this case examines very interesting questions of law, morality and public policy. In the course of its examination into the pros and cons of euthanasia, the Supreme Court screened a video recording of Aruna’s condition to be screened in to the courtroom. Support for such a practice, which clearly violated Aruna’s right to privacy, was found by the Supreme Court in the practices followed during the Nuremberg trials, where Nazi war criminals were tried! 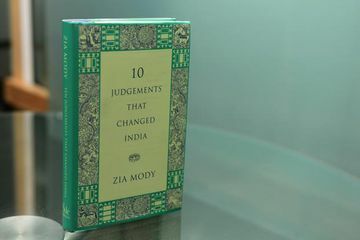 Zia Mody disapproves such an exercise of (in)discretion by the Supreme Court. The book covers the pre-case (context), during and post-case (after effects) of each case. Despite the best intentions of the judiciary, gender equality is one area where the judiciary seems to have little success.